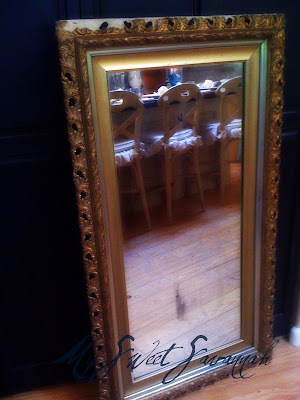 My project of the day~I bought this giant (over 4' tall and over 2' wide) mirror and although the gold color was a bit formal for my taste, I knew I had to have it! Another thing I liked about it is that it is obviously very old. 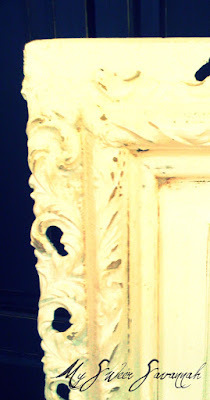 The frame was a bit chipped up and the mirror is slightly de-silvered, which I love the look of! and once it was dry, gently sanded it down and aged it a bit! It now fits in perfectly with my decor! 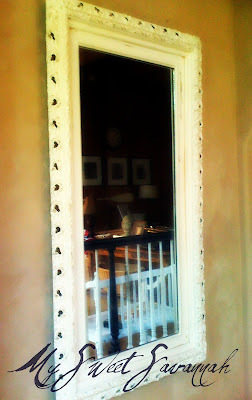 I love how the mirrow turned out....I just found a little gold oval mirror at Goodwill and I will be painting it also. Thanks for the inspiration! Pretty! If I find a mirror like that, I'm turning it into a chalk board. Beautiful mirror. Paint makes all the difference doesn't it? Love it! It looks beautiful! Love it! I love quick and easy projects. I will have to check out Roadster White, I am always looking for new creamy whites to paint stuff. 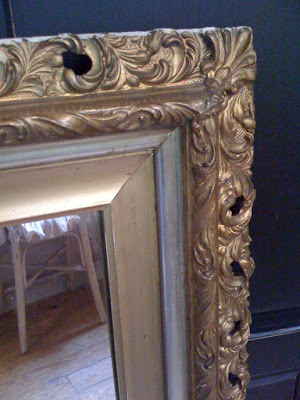 Gorgeous mirror to start with...but wonderful transformation! !